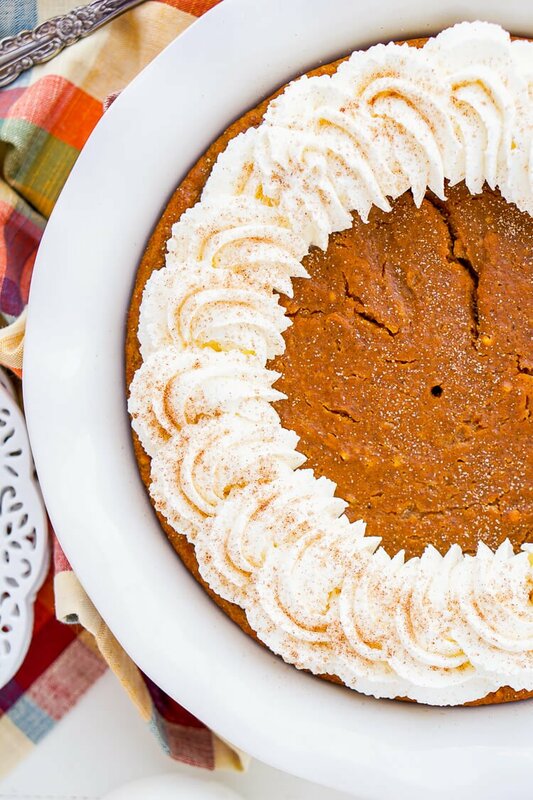 This Impossible Pumpkin Pie Recipe is actually the easiest pumpkin pie you’ll ever make! As it bakes, it forms a light crust on its own and leaves behind a dense, but creamy pumpkin filling. Top it with whipped cream and it’s the perfect fall dessert! 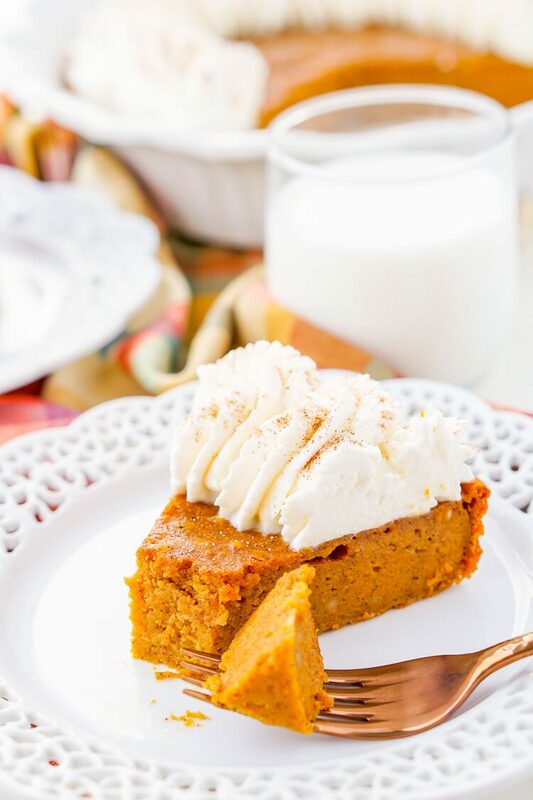 This Impossible Pumpkin Pie Recipe deserves to be on everyone’s dessert table on Thanksgiving! The first time I heard of an Impossible Pie, it was a chocolate one, and of course, I had to click over to the recipe to see just what it was that made it impossible. Well, I’m not exactly sure where the name came from, but impossible pies are actually impossibly easy and the easiest pies I’ve ever made. JUST TAKE ME TO THE PUMPKIN PIE RECIPE ALREADY! 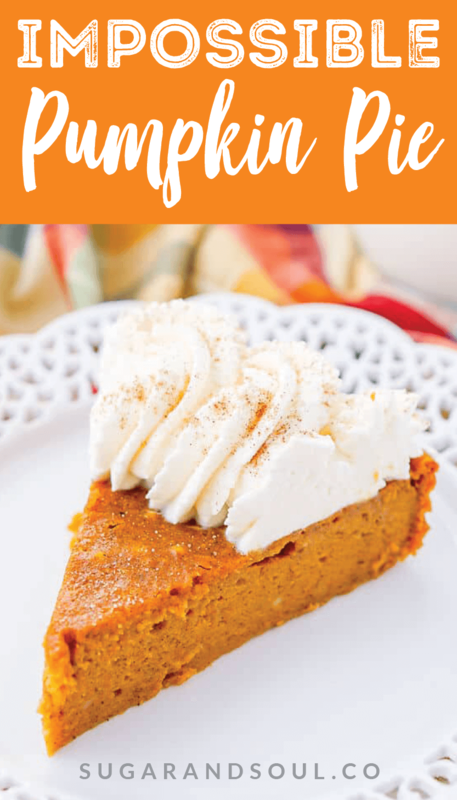 If you’d rather skip my (very helpful, I think) tips and tricks, essential cooking info, and similar recipe ideas – and get straight to this deliciously easy Best Ever IMPOSSIBLE PUMPKIN PIE Recipe – simply scroll to the bottom of the page where you can find the printable recipe card. Essentially, an impossible pie is a pie that’s made without a traditional pie crust and as it bakes, the filling creates a crust of its own. Impossible Pies are like Magic Cakes, though I think slightly less intense. But the idea is that you create one batter and as it bakes it miraculously creates different layers. In terms of the pies, the end result is a thin but definite “crust” and a thick and rich pumpkin filling. With some impossible pies like coconut, you might actually get a full three layers. You can see what I mean in the photo below. As I said, this is a really easy dessert to make! You’ll begin by making the pie itself and then you’ll make the whipped cream to top it with! Grease a 9-inch pie pan with butter and set aside. Sift together the flour, baking powder, salt, and spices into a medium bowl and set aside. In a large bowl, gently beat together the sugar, butter, and eggs. 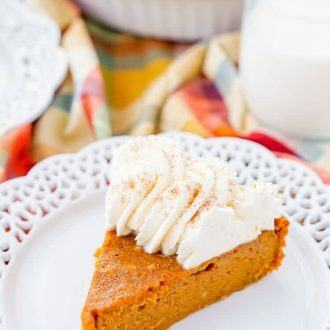 Mix in the pumpkin, evaporated milk, and vanilla. Mix in the flour mixture and beat until smooth, then pour into the prepared pie dish. Bake for 50 to 55 minutes until toothpick comes clean from center. Allow the pie to cool completely. Pie will be domed in the middle when first removed from the oven but will settle. Add all ingredients to a large bowl or stand mixer fitted with a whisk attachment and beat on medium-high until light and fluffy. Pipe prepared whipped cream onto the pie. This pie is perfect for people like me that want to make an impressive homemade pie, but who struggle with this lovely thing called pie crust. Seriously, pie crust hates me. 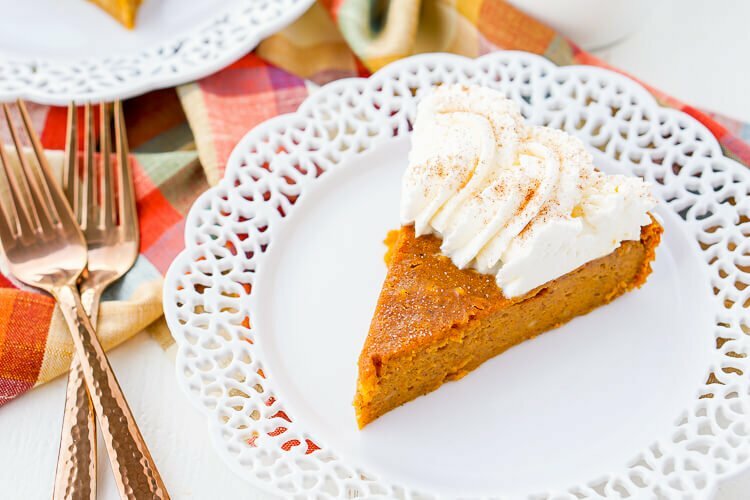 And I promise you’ll love this crustless pumpkin pie just as much! Once you add the whipped cream, this dessert is not only easy, it’s stunning too. Plus, you won’t have to spend hours in the kitchen preparing it! If pumpkin isn’t quite your thing, try my Impossible Apple Pie too! 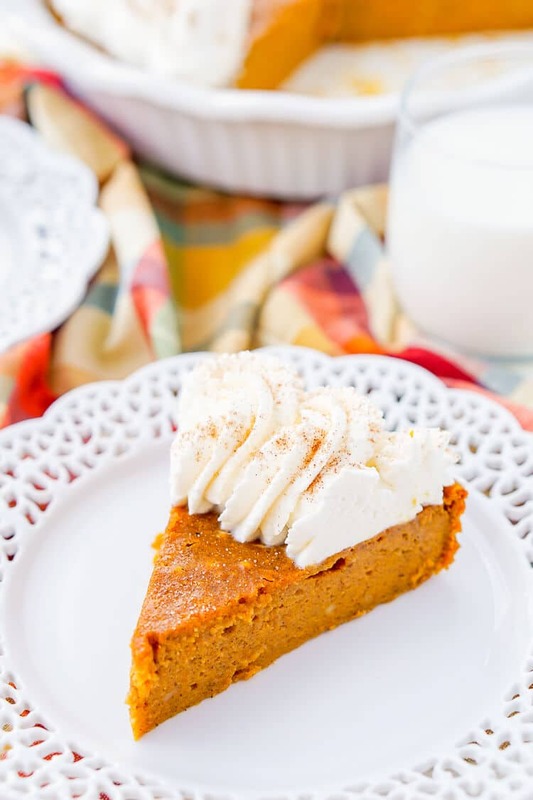 Just because this is a “kinda” crustless pumpkin pie, doesn’t mean it’s gluten-free, there is all-purpose flour in the filling, but you could sub that out with a one-for-one flour to make it gluten-free. 1 to 1 Baking FlourBuy Now! But I’m pretty certain if you were to serve this Impossible Pumpkin Pie Recipe up this fall, not a single person would complain about the lack of crust, in fact, they just might be impressed. 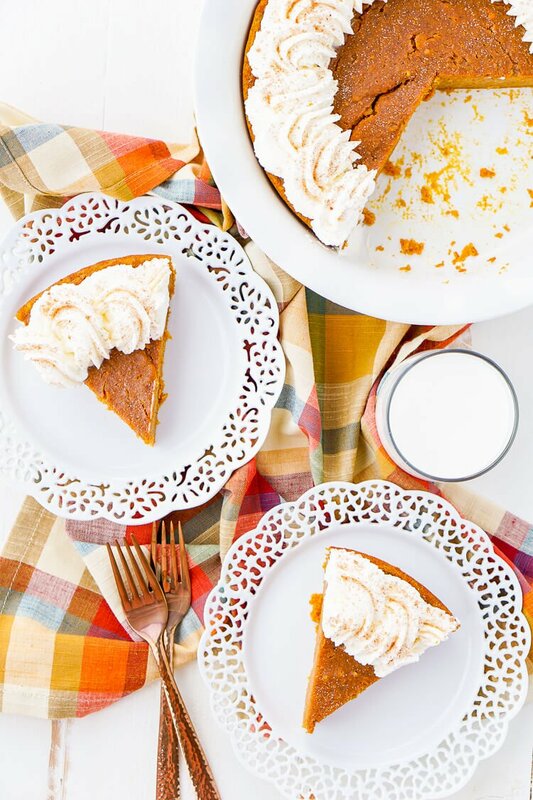 This pie is THAT good and is officially my go-to pie for fall! Pie dish – for best results, use a ceramic dish that’s oven-safe. Evaporated milk – the amount is up to you, see the recipe notes for more details. 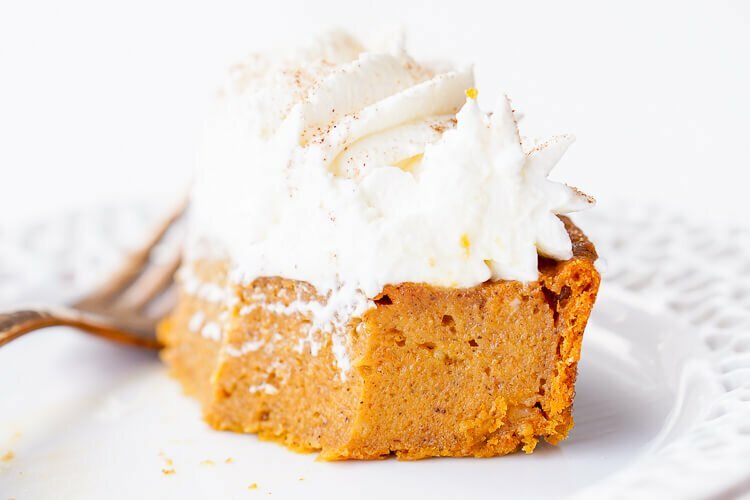 Pumpkin – You don’t want to use pumpkin pie filling, just 100% pumpkin. 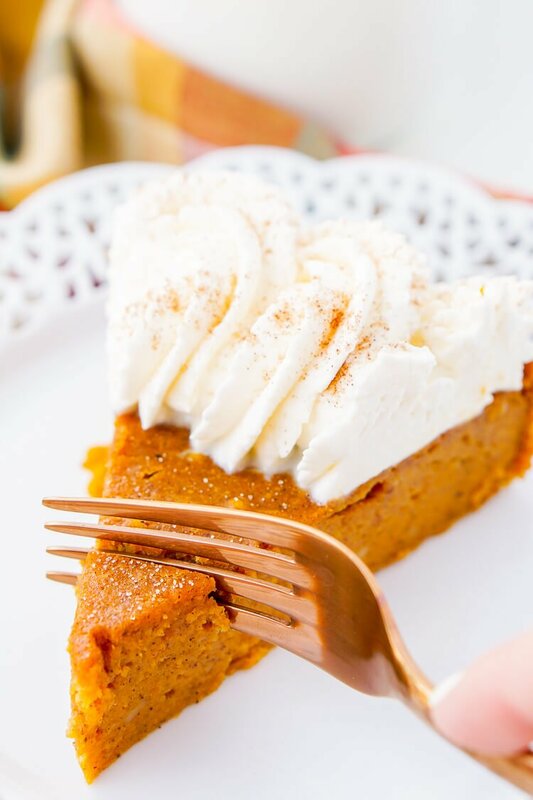 This Impossible Pumpkin Pie Recipe is actually the easiest pumpkin pie you'll ever make! As it bakes, it forms a light crust on its own and leaves behind a dense, but creamy pumpkin filling. Top it with whipped cream and it's the perfect fall dessert! You can use anywhere between 5 and 12 ounces of evaporated milk, less milk means a denser texture. Readers have also said that they've used whole milk as well instead of evaporated milk with success. Has anyone tried this with gluten free flour? Or almond flour? Coconut flour? Hi Marianne, you should be able to use a 1 for 1 gluten-free flour. Almond or coconut flour will likely not work. I’m glad you enjoyed it, Ernie! Hi Britni, Yes, just cover loosely with plastic wrap or aluminum foil. It should be good in the fridge for 2 to 3 days. I recommend pulling it out a couple of hours before serving so it’s room temperature. So glad you enjoyed it, Britni! I really want to try this recipe. I’m concerned about the amount of evaporated milk. Five to 12 ounces is a big difference. I want a dense yet creamy pie. How much do you suggest??? Hi Kali, Yes, it is a big difference. I personally have only ever made it with a small 5 ounce can, but several readers have made it with the larger can and said it turned out great. The lower liquid volume will lead to a denser pie, so that’s what I would recommend.